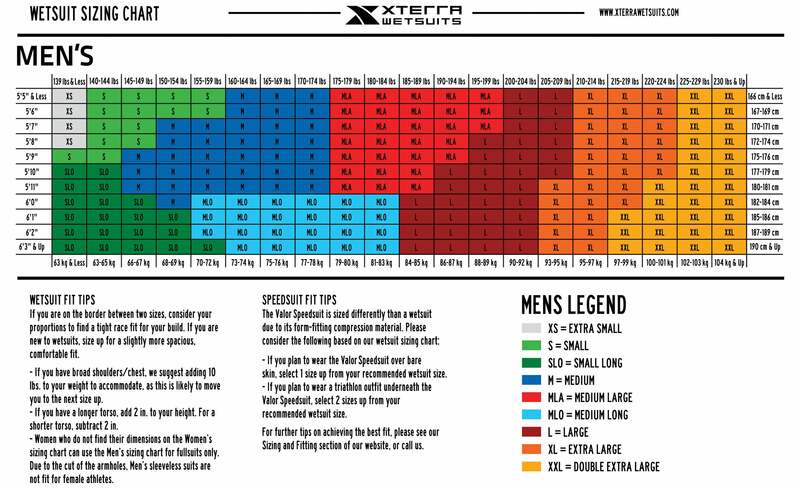 COMFORTABLE, DURABLE, FAST AND AFFORDABLE: The XTERRA Volt is the ultimate triathlon wetsuit that is comfortable, durable, fast and affordable. Get maximum flexibility with 3/2/1mm neoprene construction. Our original VOLT was named DEAL OF THE CENTURY by Competitor Magazine, and so we've created the VOLT FULLSUIT in order to guarantee that no open water swimmer or triathlete has any excuse not to have a wetsuit. The VOLT Fullsuit, with it's 3 mm on the entire front, lifts your body into an optimal position for smooth and fast swimming. The back is 2 mm for flexibility. The arms are 1.5 mm for mobility. All our wetsuits come with a 30-day money back guarantee. So, you can swim in your VOLT Fullsuit and if you are not 100% satisfied then return it for a refund, size exchange, or consider one of our other models. Ideal for shorter swims of 1.2 miles or less, or longer swims in salt water. Orders placed before 11am PST normally ship on the same business day.